The nation’s long-disadvantaged female football team may be on the verge of a major breakthrough, but they still face the challenge of long-established gender inequalities. 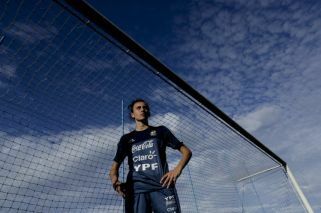 In a country where the conversation around football is overwhelmingly dominated by talk of Lionel Messi and Diego Maradona, female players in Argentina struggle to be heard. That’s changing rapidly, however, and it’s partly because of a picture that was widely shared on social media. The photo, taken in April before a Women’s Copa América match in Chile, showed the Argentine players with their hands cupped behind their right ears, a sign of protest highlighting that no-one was listening to them. It took social media to spread the message because the country’s traditional media outlets – including Argentina’s top TV channels and newspapers – didn’t even cover the continental championship. While those players are adored and even idolised, the women’s team has been sidelined – just like in other countries around the world. The Argentine Football Association (AFA) often is late in paying travel expenses, while the players have routinely faced the prejudices of a chauvinistic society that still sees the sport as a men’s only game. Still, the long-disadvantaged team of women may be on the verge of a game-changer by defying long-established gender inequalities and proving themselves – on and off the field. By finishing third at the Copa América, the team in the light blue-and-white striped shirts earned a place in the play-offs for this year’s Women’s World Cup in France. Argentina played Panama on Thursday for a spot in the 24-team tournament in the first leg. For the first time in the country’s history, a women’s national team game will be played at a sold-out stadium in Buenos Aires: the 18,300-capacity Estadio Julio Humberto Grondona in Avellaneda, home of Arsenal de Sarandí. Another major achievement came in practice. The women’s team was recently allowed to train at the same complex where Messi and the rest of the men’s team prepare for games, grounds that until recently were reserved for men only. “Women fight since they’re born because we don’t have the same rights as men. But in sports the sacrifice is twice as tough. They don’t pay you, the clothes are not the same, the sponsors are not the same,” said Potassa, who recently signed a contract with a well-known sports brand that supplies her with boots and clothing. Many female players say they feel part of a cultural change driven by the country’s strong feminist movement, which has mobilised tens of thousands to fight against violence against women, and helped them gain ground in politics and the workplace. While the men’s league draws huge crowds and brings in millions of dollars, female players are amateurs and get about 3,000 pesos (about US$82) for travel expenses at a first division club. If a woman plays for the national team, she’ll earn 300 pesos (US$8) a day. That forces players to split their time between football and a second job to survive, said Potassa, who is also a receptionist at a local college. Veteran goalkeeper Vanina Correa, the only mother in the national team, said the hardest part is being away from her children, Romeo and Luna. The four-year-old twins stay with their grandmother while Correa trains for the play-off more than 185 miles (300 kilometres) from home. “It’s very hard to be here,” said Correa, who doubles as a municipal employee. “I’m always thinking about home and wondering what they’re doing and if they’re behaving. “It would be more comfortable if we could live off football. I don’t have much left [in my career] but we’re fighting for the girls who are coming next.” That fight has been going on all over the world. Ahead of the last Women’s World Cup in 2015, a group of international players protested because the tournament was scheduled to be played on artificial turf, which is considered by many to be inferior to the real grass that has always been used in the men’s game. The tournament in Canada went on to be a huge success: It attracted the biggest crowds of any FIFA tournament outside of a men’s World Cup and broke TV rating records in North America, with the final drawing more viewers than any other prior men’s or women’s match in the United States. Following their victory over Japan for the trophy, the United States’ female team went on to campaign for, and receive, a better contract with US Soccer that brought them closer to the compensation level of their male counterparts. The Americans were not alone. National teams from other countries also won more equitable contracts with their federations, including Australia and Ireland. But in Argentina, that kind of change still seems far away and female football players must join leagues in neighbouring Brazil, Europe or the United States to make a living from the sport. One of the major obstacles they face is the lack of attention. It wasn’t until this year that a non-sports TV channel finally began broadcasting league games. Internationally, FIFA has made a point of proclaiming that it aims to raise both the role of women in the governing body and the profile of the women’s game. Fatma Samoura was appointed the organisation’s first female secretary-general in 2016, and a women’s football division was created. In Argentina, the development taking place in local women’s football is a relatively recent phenomenon. The inequality faced by the Argentines is seen in countries throughout Latin America, including Chile, which has already qualified for the World Cup. The only exception perhaps is Brazil, where six-time world player of the year Marta has given the women’s game a platform for success. “[Men’s] professional clubs don’t carry the responsibility or care about granting the girls the most basic work conditions,” said Freddy Contreras, who is in charge of the female team at Colo Colo, the most popular club in Chile. Contreras said clubs don’t lend women fields for training and only supply them with one set of shirts. The Argentine women’s team only was given access to the men’s training-ground after its poor working conditions became publicly known. “We’re being given the same place as the professionals. That’s very important to us, even if it’s small, even if it’s a detail,” she added.